JACKSON, Miss. (AP) - Gov. 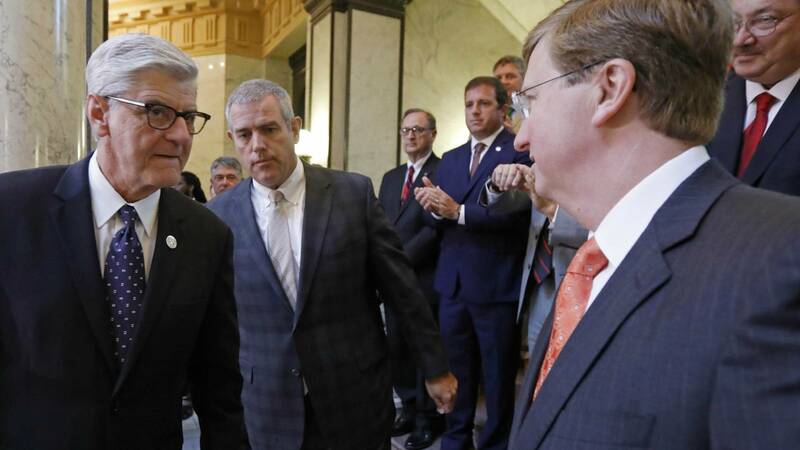 Phil Bryant says that if Mississippi creates a state lottery, the public should have access to information about the group that operates it. Reporters asked the governor Friday about a lottery bill that legislators are debating during a special session. The bill that the Senate passed Thursday says a Mississippi lottery corporation would not be subject to state laws on government transparency. "Of course it needs to be open records and open meetings," Bryant said Friday in a brief interview outside the Senate chamber. Bryant said the bill should be changed. It was moving to the House for further consideration Friday. House Speaker Philip Gunn told representatives Friday that the House plans amendments to the lottery bill. That complicates the schedule for what the governor had hoped would be quick special session, as differences will have to be worked out with the Senate. Casino lobbyists continue to express concerns that the bill might not prohibit slot-machine-type video lottery terminals that could proliferate in businesses across the state. Casinos also want a prohibition on online instant lottery games that people could play on computers and phones at home. Richard Bennett, a Long Beach Republican who formerly chaired the House Gaming Committee, has indicated the House will seek to tighten those prohibitions. Bryant said he favors that proposed change. "I don't want any type of gaming in truck stops or convenience stores, so we're going to make sure that the bill covers and puts a clear prohibition on that," Bryant said Friday. Gunn, a Republican from Clinton, also said he expects the Senate to make changes to the bill House members passed Thursday diverting some taxes on online sales to cities and counties. That bill could also face disputes if leaders decide to designate some of the $300 million in bonds the state is borrowing for particular projects. The House stripped out such provisions Thursday. Follow Emily Wagster Pettus on Twitter at http://twitter.com/EWagsterPettus and Jeff Amy at http://twitter.com/jeffamy.